Fortis provides hours of F-43 Flieger Big Day Big Date. In 2012, the company Fortis marks the centenary of the founding of the company. 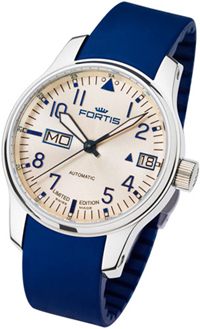 In 2012, the company Fortis marks the centenary of the founding of the company. In honor of the auspicious date of the Swiss watch company presents commemorative watches – Fortis F-43 Flieger Big Day Big Date. Design news, as well as the name implies, is made in the pilot style. The body clock round shape is made of stainless steel. Diameter – 43 mm. Water resistant up to 200 meters. Clock face is made in two versions: silver or black, with a circular guilloche and patch Arab temporary indexes, as well as hour and minute hands coated with white fluorescent substance. The dial sapphire crystal covers. The basis of new items – Swiss automatic movement. Function: Display hours, minutes, seconds, date (the aperture is located at position “3” hours). Watches are equipped with stainless steel bracelet and various straps to choose from. Among other things, the producers presented variant of F-43 Flieger Big Day Big Date with a blue rubber strap limited edition of 2012 copies. Buy fashionable watches for the price recommended by the manufacturer – 2005 euros.